I’m coming out. Am I brave or embarrassed? I’m not a real Shakespeare enthusiast. I know I’m not alone. Are we illiterate? Uncultured? Clueless? Purists can be unforgiving. Face it, Shakespeare is an acquired taste. You can learn it in freshman English, but that doesn’t mean it’s your taste. You can be the greatest theater-obsessed patron on the planet without enjoying Shakespeare. The Bard simply doesn’t appeal to 100 percent of the population. Nothing does. 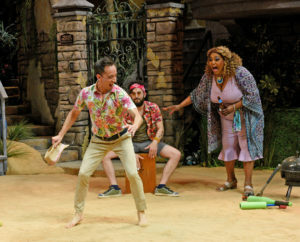 If you find someone who tolerates the genre under circumstances, who is now raving about a Shakespeare play, pay attention, and then order your tickets to “Twelfth Night,” running through April 28 at Dallas Theater Center’s Wyly Theater. One more thing: If you’re a “dress up for theater” person, you may want to reconsider. You just might get wet. The would-be curtain opens to an elaborate set that places you in the middle of the beach, replete with sand, palm trees, a gentle breeze and, yes, the hint of a summer shower following a thunderstorm. Depending on your choice of seats, you may relax in a lawn chair. The front row might just run sand through their toes. Flip-flops won’t be underdressing. Tony Award-winning director Kevin Moriarity always makes it fun when it should be. Marie Taylor’s vivid, funky, beach-comfortable, island-wear bring the story to life — Shakespeare period costumes be damned. Strings of colorful lights streaming over the set add a festive ambiance, and the welcoming home is lovely on the side of a hill. You might compare it to the villa on “Mamma Mia’s!” Greek island. Overall, Anna Louizos’ set is breathtaking. All of Clifton Taylor’s lighting perfectly fits the clever production. There were audible “Oooohs” and “Ahhhs” from the audience. Three guys, a few strings and percussion from assorted bongos and boxes couldn’t be more effective for background music, which occasionally comes downstage with solos. KJ Gray, Nicholas Rothouse and Nathan Burke provide the smooth sounds — part reggae, occasionally contemporary. Her Majesty Liz Mikel, always a chameleon morphing into another interesting character, rules as Toby Belch, Illyrian Countess Olivia’s aunt. Hardly ever still, she takes a rest on a trunk containing Malvolio, “poor Malvolio,” the Steward in Olivia’s household. He’s an inappropriately formal, uptight, out-of-his-element nerd without a real personality to call his own or, it appears, a life of his own. Turns out, he’s a love-sick suitor who is misled to believe that his unrequited love for Tiffany Solano DeSena’s Olivia is returned based on a faux letter. It’s penned in jest by Olivia’s friend, Maria, played by Tina Kaye Blair, an imp-like rascal who keeps the show moving at top speed. She’s adorable. Beyond ecstatic, Organ transitions into someone unrecognizable and puts on his most amazing performance this lukewarm Shakespeare enthusiast has seen him play out of dozens of his shows. Hard-pressed to call it a segue, his uncanny transition into a crazed wild man with yellow cross-garters has the audience building sand castles while roaring. Dallas audiences have learned to expect that from the award-winning, highly demanded actor. From Scrooge to politician to serviceman, Organ has it down. Although a member of DTC’s Brierley Resident Acting Company, you can catch him throughout town at Theatre Three, Second Thought Theatre — where he’s artistic director, Undermain Theatre, WaterTower Theatre and others. As the gender-bending, pleasantly challenging to follow plot keeps your head spinning, you may find yourself smiling ear-to-ear between laughs. While pretty true to the traditional script, Shakespeare would either applaud Dallas Theater Center’s treatment of the quirky tale or roll over in his grave. Purists would know. Grandmothers? Let’s say that this non-Shakespeare enthusiast reviewer grandmother wants to see it again. Participants agreed that there was something magical about the show. The play is 90-minutes with no intermission, which you won’t want anyway. “Twelfth Night” runs at Dallas Theater Center’s Wyly Theatre in the Performing Arts Center at 2400 Flora Street in AT&T’ Performing Arts Center through April 28. For tickets, call 214-522-8499. For more information, visit info@dallastheatercenter.org.